Discussion in 'ICE, Sat Navs & Dash Cams Forum' started by Megatr0n, Dec 28, 2016.
models that are claiming 4 x 100W output, namely the DEH-4800FD (CD player) and MVH-280FD (mechless). Sony do a couple of these models too and that they use the same design internally. Has anybody had any experience with these? Would be interesting as they're not that expensive and could bridge the gap between having a regular head unit or having one with an amp installed. One review. You could at least question that guy. Pioneer do provide more power "to the ears" than the others. Sony has been selling 100w per channel (40w RMS CEA-2006 rated) stereos since 2014 now. They aren't cheap and require decent wiring for the always-on (constant) power. But they perform as advertised if not better. Sonic Electronix used the Amp Dyno on it and it actually hit higher. So take that as you will (MEX-XB100BT, MEX-GS820BT). So I have no reason to believe Pioneer are lying, as they've always rated their amps modestly. 100w is only going to be slightly louder than 50w - about 3db, but what is more important is the ability to deliver high power over a long period of time. 2 things to consider here. The first is the capacity of the power supply. All high power head units increase the 12v supply to 24v or more to overcome the limit on the amount of current you can supply to a 4 ohm load at lower voltages. The high voltage power supply therefore needs plenty of capacity to prevent the rails from sagging and increasing distortion. This makes the design crucial and sometimes difficult to achieve in even a double din design. The 2nd point is heat dissipation. Amps are normally no more than 75% efficient, so there will be a significant heat build up at full power. Remember the power supply will also generate heat, so this needs consideration as well. I would therefore suggest that even though the output devices might be rated at 100w, the head unit would struggle to deliver this for more than a fraction of a second at a time and the difference between a 50w and 100w head minimal. I think the doubling of effective RMS wattage is more important than you make it seem. Firstly, aside from loudness, you get better and tighter bass from the speakers, without distortion (within the limits of the given speakers) and then there's also less chance of peaking the amplifier and blowing speakers at higher volumes. The Sony XB100BT and GS820BT both have a seperate amplifier board and power delivery system so the heat is spread out. They also use very efficient TI amplifier chips rated at ^90% efficiency. On top of that, they have a very chunky fuse pack, most of which houses the beefy capacitors for the power delivery. Despite this Sony still highly recommends bypassing factory wiring for the "negative" and "constant/yellow" wires. 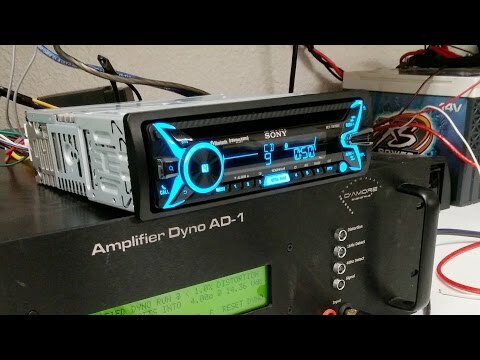 Sony, JL Audio, Pioneer, Rockford Fosgate and a few others, all make 15a compact amplifiers with very similar specs to the Sony's built-in amplifier (45w RMS CEA spec/ 100w peak) all of which are very small, and don't even house an external fuse and capacitor pack. Tighter bass and distortion is down to the design of the amplifier and power supply, not the raw wattage. The only thing I will concede is that designing around a higher voltage power rail - which is required for higher wattage will give better performance when comparing the performance against a similar design at lower rail voltages. Even the best switching amplifiers can't manage 90% efficiency in real world testing and a nominal 15A supply will actually provide short term peaks of more than 60A and a long term average of 25A without the fuse blowing. I see. Either way, it has been tested on specialized equipment that high-end car comp amplifiers get tested on, made by SMD. And it easily met and even exceeded, the specs a 1% distortion. So I guess that's all that matters. Many people would not need an external amplifier with such a set-up. Especially handy if there is no room. It reaches the 100w peak based on readings from this machine which they use to test extremely expensive high-end car and home equipment. Take that as you will. At the end of the day, it's got much better output power than any current 18w/50w peak head-unit. It requires a much beefier power delivery system, some of which is housed in break-out box behind the stereo.